Disclosure: I received a mount for review from Sanus. All opinions are my own. We have always had our TVs on a stand and while we have placed a gate around it, tiny hands and fingers like to reach around and touch. This is of great concern now that those hands come with strength and curiosity. I have caught Mason pushing the living room TV several times and he sometimes sneaks around the gate (when the cleaner forgets to put the bungee connectors back on). Hubs thinks I intentionally make it a big deal to scoot Mason away but you can't mess with safety of young children. Mounting your TV capitalizes on square footage as well as instantly giving the room an open look. It also ensures safety of your little ones by putting it out of their reach. SANUS® offers a complete line of TV wall mounts including full motion, tilting and fixed position. 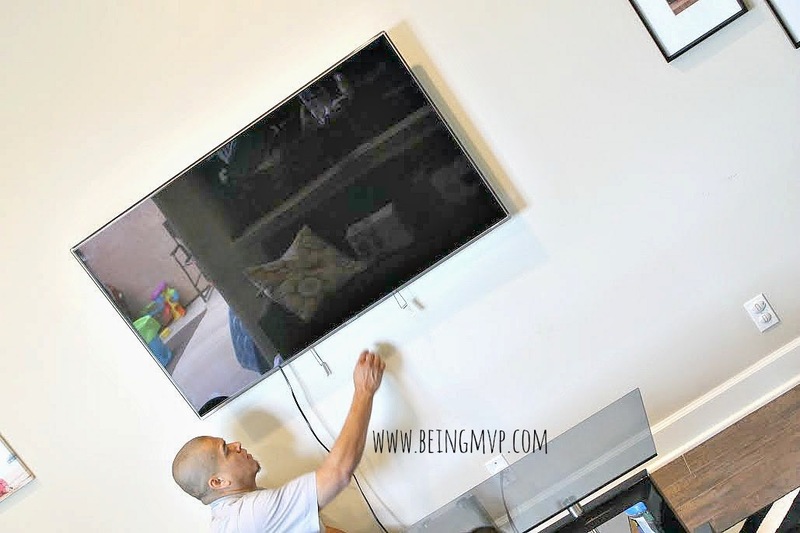 We installed the SANUS® Premium Series VLT5 Tilting Mount ($96.55 + free shipping) with our 55" TV. Rather, the electrician that I hired, installed it. I'm sure Hubs could have figured out the installation process but the process would have taken a long time plus the delay from procrastination would have frustrated me. 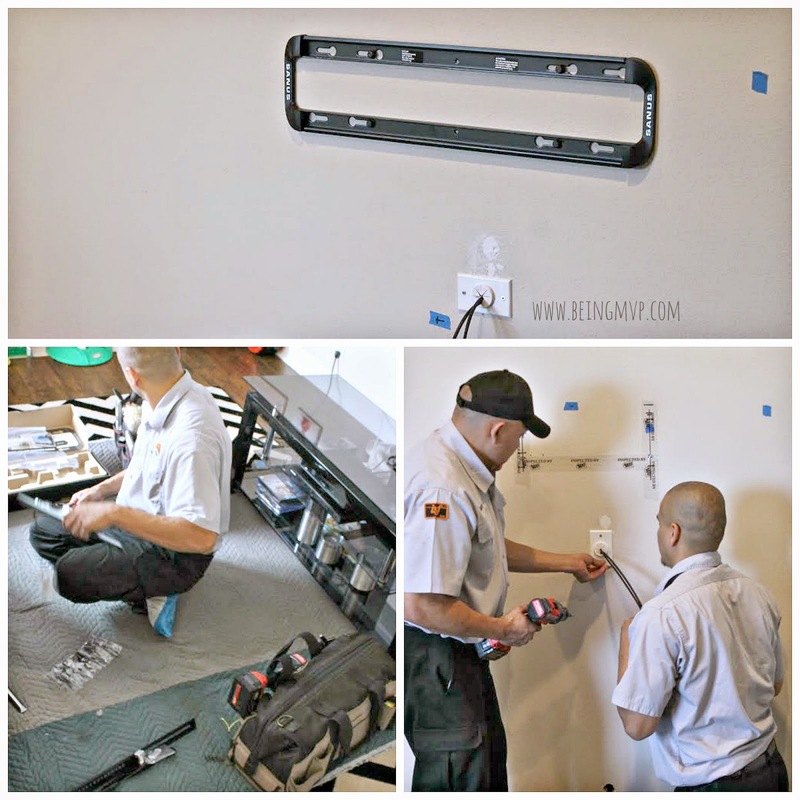 If your or your spouse are knowledgeable and handy, the mounting seems fairly doable. You will also save the $200+ I paid to have it installed. 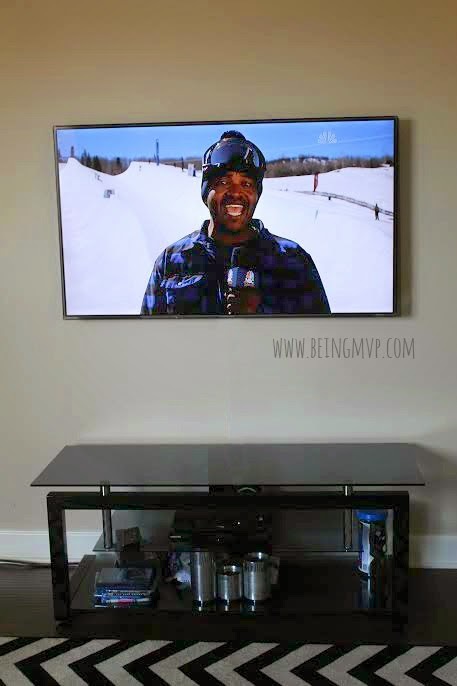 This mount is awesome and I can't believe we haven't mounted our TVs sooner. It easily tilts with one finger to adjust it to your viewing pleasure. It seems sturdy so I don't have to worry as much with the children when they are playing around it. I hate clutter which is inevitable when you have children (and a spouse). I try to clean up and organize as much as possible. Little hands like to explore and grab electronics so keep your precious remotes out of their reach or view (if they are climbers). I can't tell you how many times the kids have gotten a hold of the various remotes and changed the settings. Since these are complicated remotes, I sometimes can't figure out how to get back to the Disney channel and have to rely upon Hubs to remedy. I really want to get rid of the TV stand in general. It will mean the living space looks larger and the view to the TV screen will be clear and free of clutter. It would be nice to place the BluRay and cable box on a shelf on the wall or even behind the mounted TV. Find essential accessories for your AV system and its surrounding décor, such as the SANUS® cable tunnels to hide TV and power cords, at www.SANUS.com; this way choking hazards stay concealed and everything is perfectly accessorized and styled safely. This would be much safer for the children as well. Some day.....hopefully soon..... this will happen. Make sure to connect with SANUS on Facebook and Twitter! Great idea, also better as I always fear the tv would fall on my kids, great to have it on the wall. Makes things more functional and safer for sure. Less clutter too that accumulates. I don't have any kids but this is a great post for parents with small kiddos. Thank you for posting.